Garden sheds are relatively easy to build, particularly when you have good shed storage plans that you can use. Of course you will also need to have some basic carpentry skills, and an aptitude for DIY. 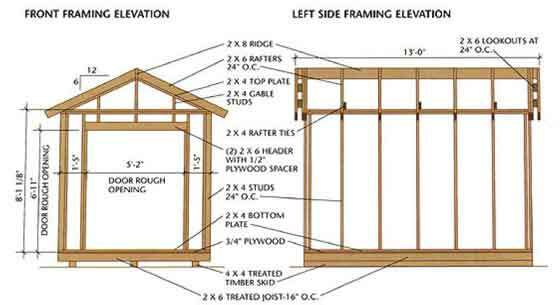 You can use two basic methods to build a garden shed: pole structures and stud frames. Both have their advantages, though in terms of carpentry skills, neither is more difficult than the other. Also, both require the same tools, and may even use the same – or similar – materials. Both are also commonly constructed with tongue-in-groove floors. This is a very old system of construction that has been used for centuries. Rafters and trusses, together with the girders and bracing required to support them; there may also be timber purlins that are fastened to the trusses to anchor the roof frame and provide a surface onto which the roof shingles or other roofing material can be fixed. Once the basic structure is complete, the sidings can be fixed to the poles or posts, windows and doors fitted where needed, and the roof completed. Stud-frame structures involve the use of relatively lightweight vertical supports combined with similar beams, rafters and so on. A major difference in the two construction methods is that stud frame structures are normally made of much lighter lumber that is spaced to provide a basic framework for the siding. They are also normally constructed on a concrete slab, or at least on firmly compacted gravel. Stud-frame structures are popular for kit buildings because panels can be made in advance and then shipped to site. It is also a convenient method for building DIY storage sheds since you can make all your panels, then erect the framework, and then fix the completed panels. Even windows can be built into panels in advance. Since sheds, whether build for storage or some other use, are permanent structures, you may need to get building approval from your local city or municap hall. Each district has their own rules so it is good to check with them. In my area you do not need approval if your shed is 100 square feet or smaller. It is always better to check first before you build. You never know what they might do if you are caught with an illegal shed. You may just have to get a permit or they might make you tear it down. But that isn’t the only reason you should use plans to build garden sheds. Plans also list all the materials you need for a particular unit, and they show in diagrammatic form how to put the building together. Often there will be a list of materials detailing quantities and size of individual materials (including lumber, screws and so on), as you can see on this great free shed storage plan that you can download by clicking here. This particular plan even specifies how many nails and screws you need for each part of the project – a boon for proper and effective planning, and for accurate budgeting. If you want to build a wood shed with plans, you will find that there are thousands of shed storage plans and drawings available, offering a wealth of different options. This means that you can buy suitable plans at a snip of the cost it would normally take to hire a professional to draw them up for you. However, you may need to add a site plan and to show where the shed will be erected on your property. Your local authority will advise. Of course if you buy ready-made plans, you will need to choose from what is available, and you might not find exactly what you want. But it really is easy enough to adapt plans and to change them if you need to. So do yourself a favor and check out what is offered before starting from scratch on our own. I would love to hear what you think. Please leave your thoughts and questions in the Speak Your Mind box provided below.